It's a tablet! It's a laptop! It's a laplet! It's a tabtop! 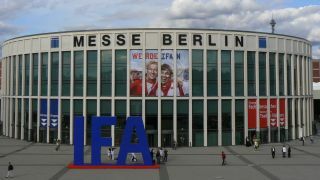 It's IFA time! IFA, which is short for IFAlotoftabletstoshowyou, is when the tech industry shows off its autumn/winter collection, the key pieces for day and night and the accessories to go with them. As with all good fashion shows there's often an overriding theme, and this year's theme appears to be hybrids. Tech that does just one thing, it seems, is sooooo last year. So who's that sashaying down the catwalk with some little black numbers? Why, it's Sony, whose VAIO Duo 11 does the day-to-night thing by letting you pop its top off when it's time for some fun. By day it's an Ultrabook, but by night it's a much slinkier number, its keyboard kicked off like a pair of work shoes. As James Rivington points out, that means "it's a laptop which has the ability to undock from its keyboard to become a tablet", which is a completely different thing from "a tablet that can be attached to a keyboard dock to become a laptop." If the VAIO Duo 11 is Sony's LBD, then the VAIO Tap 20 is a BFG: at 20 inches the "family touch PC" is a really, really big tablet. If you need to ask the price, you can't afford it. Or maybe it's just that Sony won't tell us what it is yet. Asus's collection took a more retro theme, with the firm announcing two "incredible" Windows 8 tablets that it had already announced back in June. The Asus Vivo Tab and Vivo Tab RT (the name means "to live", apparently) sound so much more exciting than the Tablet 810 and Tablet 600, although they're the same devices, and as we've come to expect from Asus there are plenty of accessories including the obligatory QWERTY keyboard docks to turn them into laptops. Our Mr Rivington isn't entirely surprised, as "even Asus' QWERTY keyboard docks come with QWERTY keyboard docks these days." To prove him right, Asus also showed off the Transformer Book, a tablet with - yes! - a QWERTY keyboard dock. The Vivo Tabs and Transformer Books weren't all Asus had to offer this year: as Jeremy Laird explains, there was a transforming PC too: "The CG8890 has an aerodynamic polygonal exterior that transforms when overclocked while the additional DEFCON and bottom grill lighting indicator shows system readiness with blue and red LED lights. Yeah, baby." It's more haute couture than ready-to-wear, and the same firm's Taichi appears to be in the same category: it's a laptop with an extra screen in the lid that makes it usable not just as a tablet, but as a two-user PC. Don't expect to see one in the high street any time soon. For fashionable tech you will see on the high street, you should probably turn to Samsung: its Series 5 and Series 7 Slate PCs "straddle the line between a tablet and a laptop as a result of their most compelling feature: The ability to shift, Transformers-style, between a notebook and a tablet using a detachable keyboard," David Murphy says. Sadly for Samsung, its products were somewhat overshadowed by legal troubles - not, thankfully, the kind of troubles affecting designers such as John Galliano, but expensive troubles nevertheless. A US court found the firm guilty of turning up in the same outfit as Apple - er, we mean infringing some of Apple's patents. The court levied a $1.05 billion fine, which could be trebled by the judge later this year, and rejected Samsung's counter-suit. Apple immediately demanded a sales ban on eight key Samsung pieces for violating design patents, utility patents, trade dress or combinations thereof, although Apple has to prove that letting Samsung sell those products would cause Apple "irreparable harm". It's an important victory, but it's not as huge as it looks: while a billion dollar fine is an enormous amount of money, Samsung spends nearly three times that amount every year on shoes. And by "shoes", we mean "marketing".